I was so hoping for a pink toe! I’m sure Joe wouldn’t have minded! Joe NEEDS socks with pink toes…or purple! I recently had 4″ left….. yarn chicken win!!!! Well done! Did you consider weighing the first sock to see how much yarn it took? I guess that might be hard to do while travelling, though. Love the yarn–very manly. She did. But the scale had a dead battery. Way, WAY too forward-thinking to try splitting the skein into two (by weight) before you started, and knitting toe up, right?!? I mean, where’s the fun in that!?? I just finished my daughters Xmas scarf-also late.4 inches left.I had to knit till 2am because I was sure it would run out if I waited till the next day. Dawn might have shrunk the skein? Kudos for finishing the sock. You had just enough yarn, IN REAL LIFE!! Be glad Joe doesn’t prefer handknit union suits. I have been blessed with two wonderful sons-in-law who both have size 13, love hand knit socks, and are knit worthy. 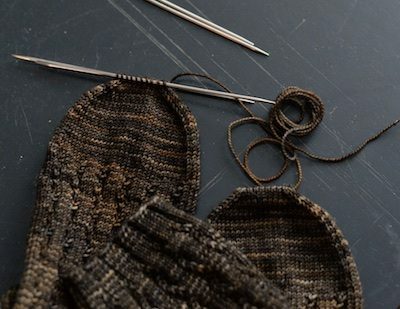 It is a measure of my devotion that each has received a pair of socks, but oh how I dread tackling those long, long rows of stitches in the feet again! That is a beautiful end to a game of yarn chicken — plenty to Kitchener but not so much that you feel you have to keep the leftovers. My husband has feet that aren’t too enormous (only about an inch longer than mine), but for a while he only wanted socks in black or gray yarn. Then he declared that he had “enough” socks. Hearing those words were one of the best gifts he’s ever given me! Too funny….I can relate to the scale thing. My scale round up or down to the nearest gram and, sometimes, leaves me wondering whether it’s being honest with me. I think I need a better scale, like, a scientific balance beam. Love my triple beam balance. Never out of batteries or need to plug it in. You may be able to find one on a Craigslist (I found one for $75 US) or ask at a local high school or community college, they don’t use them much any more. My feet are size 11. My dad and brother (both of whom I’ve knitted socks for) are both 13. My husband wears 13, my FIL, too, and MIL wears 12, and has big ankles. I knitted socks for some people of normal shoe size as thank-yous for being part of my wedding 3 years ago, and it was such a treat to knit women’s size 8-9 socks and men’s 8. It went quickly and I had leftovers! Phew! I can feel the anxiety just looking at those last 10 yards. OMG, that’s close. That’s not even enough to knit a tiny sheep on size 1s IN REAL LIFE. (I usually take the leftovers and knit a MochiMochiLand pattern when I’m done – right now it’s flamingos for the youngest child away at college). Well done though – can’t wait to see them being modeled? I love that idea for bits of leftover! A race to the end IN REAL LIFE. Holy cannoli. What a great photo finish! Ahhh….you admitted, right up there at the beginning, that you didn’t finish on time. I confess. I don’t knit for my giant ski-feet guys anymore. I buy SmartWools instead. And knit more for my tiny feet MIL. And they’re all okay with that arrangement. here in florida we call them surfboard feet. and while my husbands are not terribly long (only 11 1/2) he has 4E feet so a round takes FOREVER. Oh yeah and the last time i was knitting socks he asked for a toe box shaped specifically for his feet. WHAT but you know I did it. I just kept trying them on his feet and now he can only wear them on the designated foot. Oh, man, I thought I had it bad with my boyfriend’s size 10 triple E width feet. He got his first pair of socks this Christmas (after 7 years) and has been warned to treat them nicely, as he won’t get another pair anytime soon. What’s sad is that El Husband loves jazzy colors and patterns and would have no compunctions about wearing flashy not-boring socks, if only I didn’t go EEEE every time I contemplate it! I TOTALLY get this! My 14 year old son wears a 14W in shoes, so knitting socks for him is always kind of a pain. I have made many pairs that are all the same yarn for about one and a half socks, then the second half of the second sock is something totally random. They’re actually kind of fun because they still match, just not 100%. Yay for you!!!! Not true. My hubby has size 6 feet. I have a husband and grandson with enormous feet. My grandson is also very tall which means longer socks. A ball of yarn over 400 metres leaves me with little when finished. I’ve worn my teeth down these last few years with gritting them as I near the end of sock two, so Inderstand perfectly. I am blessed with a small footed family – my brother who is 6 ft tall only has size 6 feet. Although he made up for that when he married my SIL – hers are size 10! I’m venturing into Yarn Chicken territory with the gloves I’m knitting for myself. Using a remnant from my grandmother’s stash, so if there isn’t enough, I’m doomed. Doomed to wear gloves with mis-matched cuffs, anyway. I decided I could bear ‘mis-matched cuffs’ better than ‘mismatched assortment of fingers’ so I’m starting with a provisional cast-on and will add the cuff later. Which will of course mean that it doesn’t quite match even if I do have enough yarn, but at least that will help me remember which of my hands is the left one. Much much better to knit faster and faster than to avoid the thing and take forever to finish it–which I did once, ending up with a yard left over after finishing my daughter’s sweater. I think we’re missing the point here, which is the empirical evidence that knitting faster enables completion to outrace supply. Data. It’s all about data. Oh Rams, we do love you. Write it up as a grant proposal. Get paid to knit while proving or disproving your theory. Can I be on that research team? So glad you made it Steph, I’m kind of nervous what size my hand knit sock loving 9 year olds feet will be when he’s done growing as he already has feet the same size as me (10 inches long) and his birthday wish list last year was 6 pairs of hand knit socks at the very top so 6 pairs of socks he received and he wears them a LOT so will need replacements soon enough-lucky he got 6 at once to spread the wear lol. I’ve given up on knit Christmas gifts. Maybe I’ll start again when the little people need less help with everything and there aren’t diapers to wash. Your gifts are lovely though. I was playing yarn chicken on my last project. I’m glad it’s not just me who knits faster, hoping that it will help. Whew, that was close! and Rams is right as always…..
Will someone please recommend a good (and easy!) toe-up sock pattern? I have tried several times and can’t seem to get started without mucking it up. I can do cuff-down no problem as well as 2-on-2-circs but the cast-on part defeats me. Help? My fave toe up pattern. It’s so true that you become a speed knitter when you’re playing yarn chicken. I’m glad it worked out for you this time. I’m completely beguiled by the yarn name– Descent of Woodpeckers. Where on earth do they come up with that? I just love it. That deserves a rim shot. Alisha Goes Around now lets us drool over her yarns only at local shows and yarn crawls. I’m fortunate enough to live in her neck of the woods in Texas and have spent a goodly amount of my retirement savings on her beautiful and wonderfully named yarns. The next time I see her, I’ll ask about our Esteemed Leader’s/Enabler’s yarn needs. Maybe she will let us work some magic ……. I keep a stash of yellow sock yarn so I can make Gold Toe socks for my men. A toe of alternating rows with the yellow looks very classy. Congratulations on your Yarn Chicken win! BTW, the cold is a liar. You are clearly loved. Yes!!!! I recently finished some mittens with mere snippets of yarn left. I was sweating buckets! I’m glad you won! My husband has such small feet that he often buys women’s shoes because very few men’s shoes are small enough, but he won’t let me knit him socks. An excellent game of Yarn Chicken! Bravo! Well played game of yarn chicken there, well played. I feel your pain on the socks for big feet (size 18EEEE here). I just automatically buy two skeins of sock yarn and know I’ll have a little bit left over, which I use to reknit toes. For some reason, he wears them out. I feel your pain. I knit socks for my step-dad, and my step-dad only. He loves them, and will walk up to strangers and pull up his pant cuff to show off the socks his daughter knit. How can you not make him socks? Well, his feet are 12 inches! Ugh. I started making toe up, 2 at a time, out of self preservation. When the yarn runs out, that is his cuff. I once threatened to make him hot pink acrylic socks, btw. Some day I will make him bright pink socks, when I find some neon wool! Love this! I needed a good laugh. I was so thinking Joe would have a sock with a pink toe and then you would have frogged the other toe to match it (such a Yarn Harlot thing to do). Joe should get some socks with hot pink toes! I thought Barrel Rider was a sock pattern for hobbit feet. Thank you for your blog. It is great story about the yarn. Takes mind off all the stuff going on. Too much hate right now. Glad for my stash of yarn. Hope I have enough. Allow me to brag on this one thing: I have a small husband with size 7.5 feet who loves ANY sock I knit for him, the wilder the better. One skein of Opal or Berroco in whatever self-striping colors I choose will make socks that make him happy. He goes around pulling up his pants legs and proudly showing them off. I have made him a drawer full. And yes, I know I’m among the luckiest women alive. I have a husband with size 15 feet (!!!!!!) and a 46 inch chest, who has just requested an aran jumper and socks … I think I win the large feet top trumps. (Just in case I don’t, I have two sons with size 12 and 13 feet who have 40 and 42 inch chests and like their jumpers ‘loose, please mum, with extra long sleeves’). In my next life I am going to look elsewhere for my life mate. Pleased you made it with yarn to spare – and at least it got you knitting faster so job done! I don’t knit socks anymore, since three pairs turned into holes. But I do enjoy a good tussle with Yarn Chicken. And that’s why I only knit toe up socks :D.
I also divide the ball of yarn in two evenly weighed smaller balls, one for each sock. You are a braver soul than me. I can’t tell you how much i enjoy your blog, your sense of humor never fails to lift my spirits. You truly do make a difference in this world and your blog is the only one that I make time for every week. I am hoping that you won’t think this too crazy – but is there any hope that you would do another calendar? I kept mine until some mindless NON-knitter threw it away! That is insane. 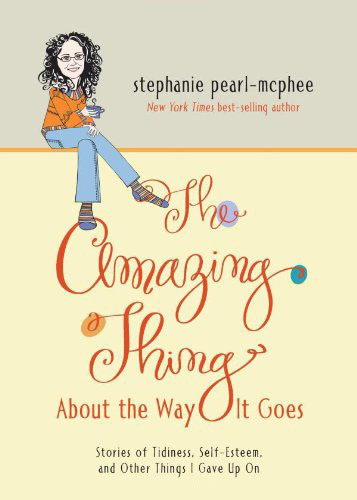 Thank you for writing such entertaining books with sound advice and incredible humor. I refer to my son as Big Foot – size 13! Interestingly enough, I notice that sock yarn is starting to come in larger skeins or is paired with a mini skein for heels and toes. I now routinely knit contrasting heels, toes, and cuffs. I also knit toe up, so if I run a little short, the tops can be a little short OR if the contrasting cuff is not a perfect partner, it is less likely to show. Astounding. I (wrongly) jjust eyeballed my last skein of sock yarn, and now have a sock that has a cuff that could have been longer, and will have a second sock that comes up to my waist. Son and husband have size 11 and 13 respectively. They get Boring Dude Socks. I end up playing chicken with fancier ones. and my husband is allergic to wool. Blue Moon Sock Candy is the best – it takes close to 300 yards/ sock! I simpleymust dive in and try socks again. My first tries made me laugh… I read faster and faster to get to the pink toe – but not. Brilliant work. Ha! “tons” left. That’s the thrill of knitting! Great pattern. I feel like if you made one sock have a pink toe, you’d need to make the other one have a pink toe too. I knit worsted weight socks for my brother an son-in-law who enjoy the outdoors. I always buy coordinating yarn as my son-in-law has very large feet and my brother has small feet. I have enough to make plain socks for my brother and my son-in-law gets socks with contrasting toes. I’m still usually playing yarn chicken for socks for my son-in-law. My cold is making me feel angry, unloved, and doomed – alternately and occasionally all at once. That picture made me smile for the first time today. Thank you! I’m glad you’re back. I know you had a wonderful time skiing and all, but you’ve become part of the rhythm and fabric of our lives, and we do miss you most grievously when you’re gone. And the socks are beautiful! Only a knitter would define that amount of leftover yarn as “tons.” And then s/he would promptly squirrel away that bonanza of extra yardage for a future project…because you never know when you’ll need it. Sounds nuts – but I feel it works for me. I put the finished sock in one hand, roll it in a ball in the fist of one hand then take the remaining yarn and jam it into a ball in my other hand If there is a lot of overflow in the yarn ball fist and not so much in the hand holding the finished sock, then I know I have enough to complete my sock. Of course I do this only when my scale is not handy. I too knit faster in the hope that it uses less yarn that way. I’m glad I’m not the only one. I feel the pain of large feet. My hubs 15EEE and then when I knit for his family they women even have large feet. I made 25 pairs of socks a few year ago and the only small pairs I made were for my Mom, my Niece and myself. For some reason this year I am planning to do it all again!! My husband has size 11-12 feet, and my holiday knitting over the Xmas period is always a new pair of socks for him for the coming winter (we live in the Southern Hemisphere). I’ve knocked the first one out for this year, but the second is much slower (so big!). My own feet are so much smaller, so my own socks seem to knit up so much quicker! Socks do make excellent camping-friendly knitting – so portable. My fiancé wears the same size shoe I do, a nice little size 6, means lots of leftover yearn when I make socks for either of us! I wouldn’t ever knit socks for the last boyfriend and his size 13 feet, I did the math out once and said no way you get a hat! I love that, as I was reading this aloud to my husband, when I got to the part where you were on a plane and had to go ahead and start the second sock, he just nodded sagely, like that had happened to his own non-knitting-self before. He’s a knitted at heart.